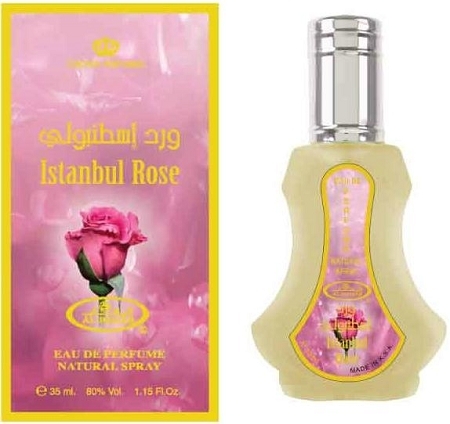 Istanbul rose is such a beautiful rose scent, nothing else, just the fresh rose, and it's a strong rose. That makes it easy to layer but it's gorgeous all by itself. It reminds me of the attar oil Roses. Two sprays lasts all day. You will love this scent. I was looking for Al-Rehab's Roses, which I adore, in a spray form for a gift. After reading the reviews I took a chance on Istanbul Rose. It was a hit with my friend, and I loved it as well. I dare you to find a better pure, unadulterated, fresh, rose scent. It will last and smell great after many hours as well. You can't go wrong with any of the Al-Rehabs. My friend and I have purchased a couple dozen different one between us and they are all amazing. It's just a matter of what scent you are in the mood for. The scent is like being in a highly scented rose garden. So, if you like roses, you'll like this.